Outdoor home improvements are a great way to add value to your home and add extra living space. J & A Construction NJ Inc has over 19 years of experience building decks, patios, and porches. Our quality craftsmanship speaks for itself when you see a home that has been enhanced with a deck, patio, or porch designed and constructed by J & A Construction NJ Inc. Call (201) 371-6061 to find out how you can add value to your home by adding outdoor living space. Do you want to be relaxing on your own deck or your brand new patio? Decks offer multi-story homes a transition space to the outside. Decks also give you added living space for entertaining and relaxing. 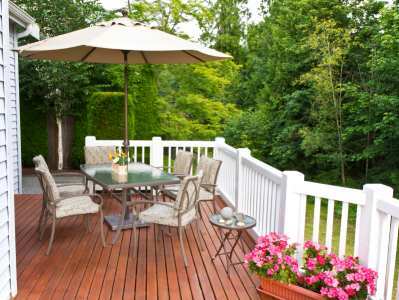 J & A Construction NJ Inc will design and build a deck that complements the style of your home. We will work within your budget to select quality materials that can withstand all types of weather conditions. Patios offer both multi-story and single story homes a transition space to the backyard. We can create a formal patio with an intricate geometric pattern using pavers or brick. If you're looking for a patio that is less formal, we can do that too. If you need durability, a concrete patio may be a great solution. Whatever your needs and budget, J & A Construction NJ Inc will work with you to create a stylish and functional outdoor living space. Make your home a welcome invitation. Adding a porch to the front of your home is one way to add instant curb appeal. Front porches create a homey and welcoming feel to your home. They also offer visitors protection from inclement weather when they come to your home. J & A Construction NJ Inc can build a front porch that matches the style of your home and offers functionality. Your new outdoor living space can soon be your new oasis! J & A Construction NJ Inc can add outdoor living space to your home. Whether you're looking for a deck, patio, or porch, J & A Construction NJ Inc can build a space that increases the value of your home and gives you and your family more room for relaxation. Call (201) 371-6061 to find out how easy and affordable it is to enhance your home with a deck, patio, or porch.